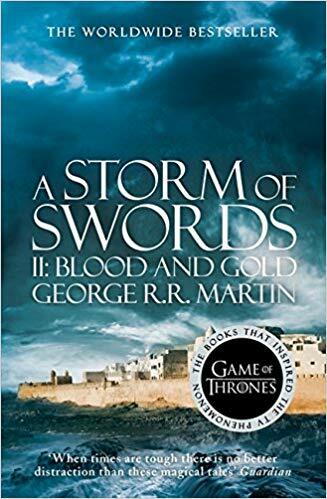 A STORM OF SWORDS: BLOOD AND GOLD is the SECOND part of the third volume in the series. The Starks are scattered. Robb Stark may be King in the North, but he must bend to the will of an old tyrant if he is to hold his crown. And while his youngest sister has escaped the clutches of the depraved Lannisters, Sansa Stark remains their captive. Meanwhile, across the ocean, the last heir of the Dragon King approaches Westeros with vengeance in her heart.